A crowd of fifteen thousand watched the spirited Indian sepoys shot dead for revolting the previous month. This demoralized 800-strong garrison of Punjabi Muslims — who had, it need hardly be added, a noble history of insurrection to think upon — was already deployed far from home to look after the imperial interests of the London gentry while British lads mustered for bayonet charges in No Man’s Lands. Around 40 died in a few days before a mixed British-French-Russian-Japanese force arrived to crush the revolt. It was just one among a number of insurrectionary outbreaks during the war to rattle Britain’s possessions in Asia and elsewhere. 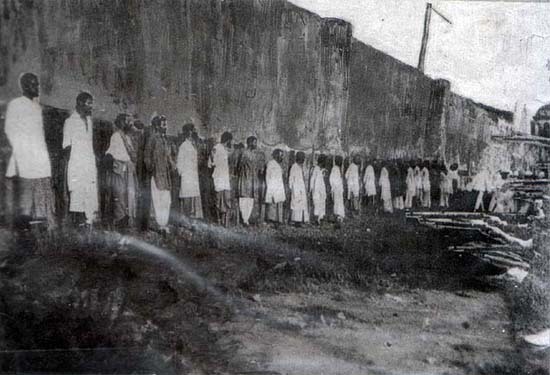 Punishments meted out this day were not the end of it at all; the court of inquiry sat until May, sentencing several dozen to death and many others to prison terms or penal transportation. And if the mutiny never really threatened British control of Singapore, the ethnic and religious fissures it exposed in the imperial order have obvious resonances (pdf) for our present day. In order to distinguish mutineers from peaceable citizens, all Indian residents were required to register and obtain passes. This aroused considerable anger, which was exacerbated by the cavalier attitude of some registration officers, who acted as if all Indians were to blame. * The Ottomans had also issued a call to jihad with the onset of war, hoping to drive just this sort of wedge among Britain’s colonies.